A “kouloura” (koo-LOU-rah) in Greek is a round twist. 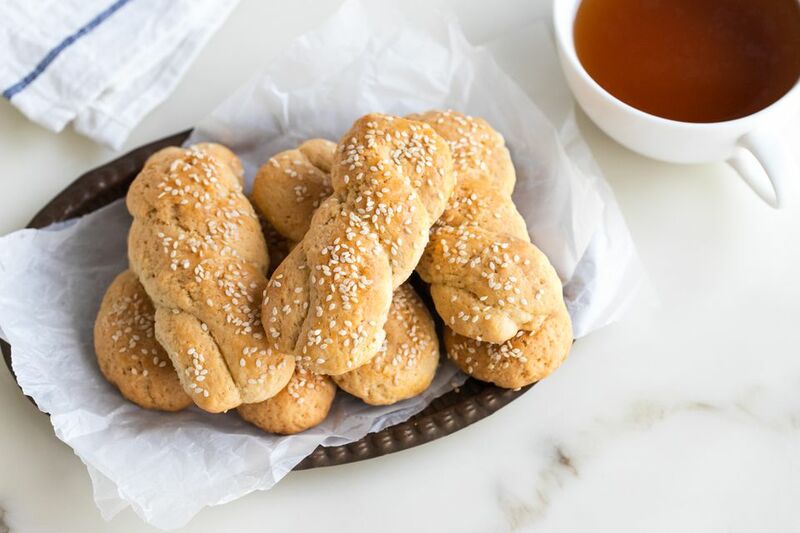 The name for these traditional butter cookies comes from their round twisted shape, but you will also see Koulourakia as small braids or in the shape of the letter “S.” Koulourakia are delicious dunked in coffee or milk and are the traditional Easter cookie. Using the mixer, beat the butter and sugar until light and fluffy. Add the vanilla extract and ouzo and mix well. While the mixer is running, add eggs one by one and mix until well incorporated. In a separate bowl, sift the flour with the baking powder and soda. Add the flour mixture to the butter mixture little by little. The dough will be soft and malleable but it should not be sticky. You should be able to pinch off a ball of dough and roll it into a cord or thin tube. If the dough is too sticky, add a little bit more flour. Allow the dough to rest a bit before rolling into shapes. To shape the cookies, pinch off a piece of dough about the size of a walnut. Roll out a cord or thin tube of dough about the length of a dinner knife. Fold in half then twist two times. You can also make a coiled circle or an “S” shape. Beat the remaining two eggs in a bowl and add a splash of water to the egg. Brush the cookies lightly with the egg wash and sprinkle with sesame seeds if desired. Bake cookies on parchment paper or on a lightly-greased cookie sheet for approximately 20 minutes or until they are nicely golden brown.